Flood season is upon us. Knowing ahead of time when a flood is going to happen, where flooding will occur, who will be affected, and how to respond is of great importance to reducing loss of life and property. Below you will find five story maps that show flood impacts and the damage each event had on life and property. These stories serve as reminders to plan ahead and be prepared for a significant flood event. Esri is partnering with communities, such as San Bernardino County, to mitigate the effects of flood events on lives and property. This story map visualizes damage assessment data, including nonresidential and residential. The blue polygon represents the final flood extent, showing how the flood spread throughout Alexander County. Knowing what areas will be impacted is critical in preparing for a flood. According to the NOAA’s National Centers for Environmental Information (NCEI), the 2015 flood across Missouri, Illinois, and the Midwest had an impact of an estimated $3 billion (http://moneynation.com/u-s-floods-cost-34-billion/). Throughout this story map, you can see the flood extent in Cape Girardeau, Alexander County, Jersey County, and Peoria County. These images have helped ongoing research efforts for testing and developing standards. 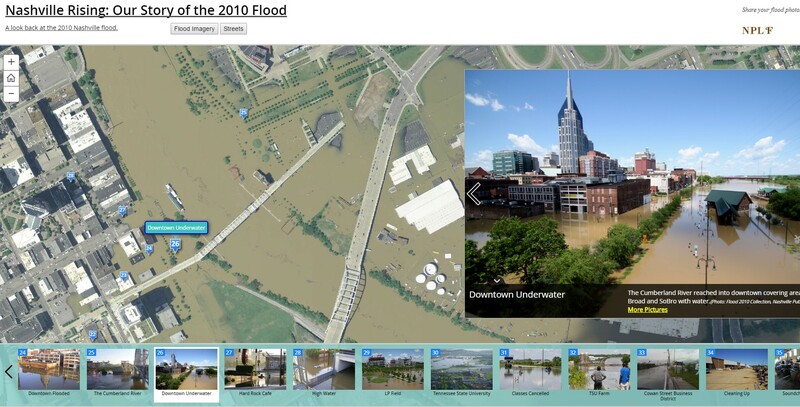 Another example is the historic flood that occurred May 1 and 2, 2010, in Nashville, Tennessee. Nashville received more than 13 inches of rainfall, forcing the Cumberland River and several others over their banks. The historic flooding devastated areas throughout Nashville and surrounding counties, taking lives and destroying homes, businesses, and roadways. A massive community response resulted in more than 25,000 volunteers helping with cleanup and repairs. According to The Tennessean, the flood caused more than $2 billion in private property damage and $120 million in public infrastructure damage. One year after the flood, The Tennessean, citing the Nashville Area Chamber of Commerce, reported that 300 to 400 businesses remained closed, and 1,528 jobs were “very unlikely” to return (http://www.tennessean.com/story/news/local/2015/04/30/nashville-flood-20-things-to-know/26653901/ ). 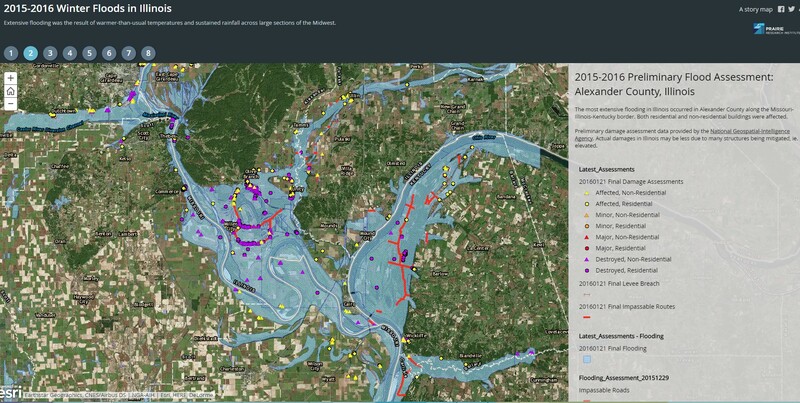 In this story map, one can view the impacts of this historic flood. Extreme rainfall between September 10 and 18, 2013, caused extensive flooding and record streamflows across the state of New Mexico, resulting in two presidential disaster declarations totaling more than $18 million. In this interactive story map, you can see the flood impact on numerous communities within the Rio Grande River Basin. Ventura County experienced a significant five-day rain event from January 7 to 11, 2005, that resulted in widespread flashflooding and river flooding across Southern California. Over that five-day period, many of the mountain locations across Santa Barbara, Ventura, Los Angeles, and San Bernardino Counties had rain totals that were between 20 and 30 inches, with some locations near 40 inches. 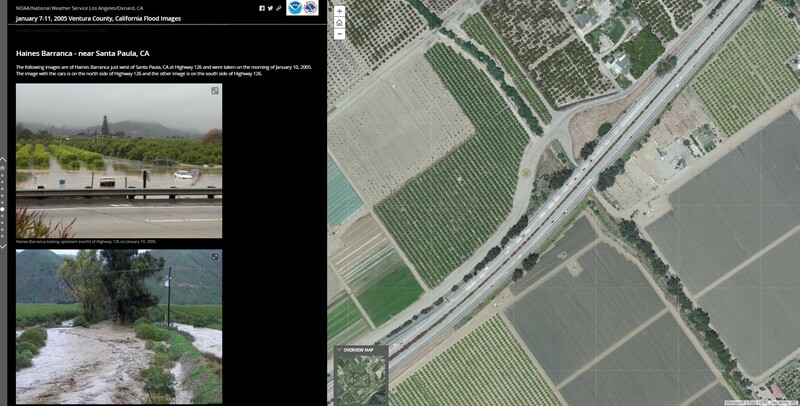 In this story map, you can explore the property damage as a result of flooding in Ventura County. Over the summer of 2013, the province of Alberta, Canada, experienced one of the worst floods in its recorded history. As of February 2014, governments have spent $553 million in operating expenses and $40 million in capital spending, including over $425 million in Disaster Recovery Program funding (http://www.alberta.ca/flood-recovery-update.cfm). It is estimated that provincial and federal governments will spend nearly $5 billion to recover and rebuild. These five story maps show how floods can affect many lives and cost millions in property damage. I recently wrote a blog entry in Esri Insider called “Are you ready for the storm?” Here I discuss the three critical steps a community can take to prepare and respond to flooding events. In addition, Esri hosted a webinar titled Flood Best Practices: Protecting People and Property with GIS. I invite you to watch the video recording and learn how San Bernardino County is prepared to respond to the next flood event. I leave you with one question: Is your community safe from the next flood? To learn how Esri can help, visit the Solutions for Flood website at go.esri.com/solutionsforflood.